At The Intimate Theater, Luckman Fine Arts Complex, 5151 State University Dr. Paid parking available in the lot just north of the Luckman Fine Arts complex. Alfredo Salomón,  2002,  1 min., color, sound, digital, México. Institúto Cubano de Artes e Industrias Cinematográficas,  1960,  1 min. , b&w, 35mm transferred to digital, Cuba. Rafael Montañez Ortiz,  1958,  2 min., b&w, sound, 35mm reduced to 16mm and transferred to digital, USA. Nicolás Guillén Landrián,  1969,  17 min., b&w, sound, 35mm transferred to digital, Cuba. Ricardo Nicolayevsky,  2002,  2 1/2 min., b&w, sound, digital, México. Marisol Trujillo, Miriam Talavera, and Pepín Rodriguez, poem by Ernesto Cardenal,  1983 , 8 min., b&w, sound, 35mm transferred as digital, Cuba. Eduardo Menz,  2004,  12 min., color, sound, digital, Canada/Chile. Nicolas Testoni,  2012,  5:20, color and b&w, sound, digital, Argentina. Taller Independiente de Cine Experimental,  1978,  2 min., color, sound, super-8 transferred to digital, México. 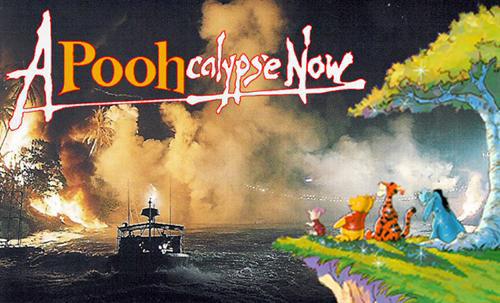 Still from Apoohcalypse Now, Artemio, 2002.